Rocking Horse Plush Just $45.98! Down From $110! PLUS FREE Shipping! You are here: Home / Great Deals / Amazon Deals / Rocking Horse Plush Just $45.98! Down From $110! PLUS FREE Shipping! At Amazon, you can score this Rocking Horse Plush Animal for just $45.98 down from $109.99 PLUS FREE shipping! The Rocking Horse Plush Animal on Wooden Rockers with Seat & Seat Belt and Sounds, Ride on Toy for Babies 1-3 Years, by Happy Trails will be your child’s or grandchild’s furry friend and a special keepsake. With life-like features and sounds, this makes the perfect gift for birthdays or holidays, making this the best choice you’ll ever make. Happy Trails products feature a wide variety of rocking and spring ride-on animals for the animal-loving child in your life. EASY TO ASSEMBLE – The Rocking Horse is easy to assemble and easy to ride. It is hand-crafted with a wooden core and built on strong wooden rockers with handles for balance, making this a sturdy riding toy. 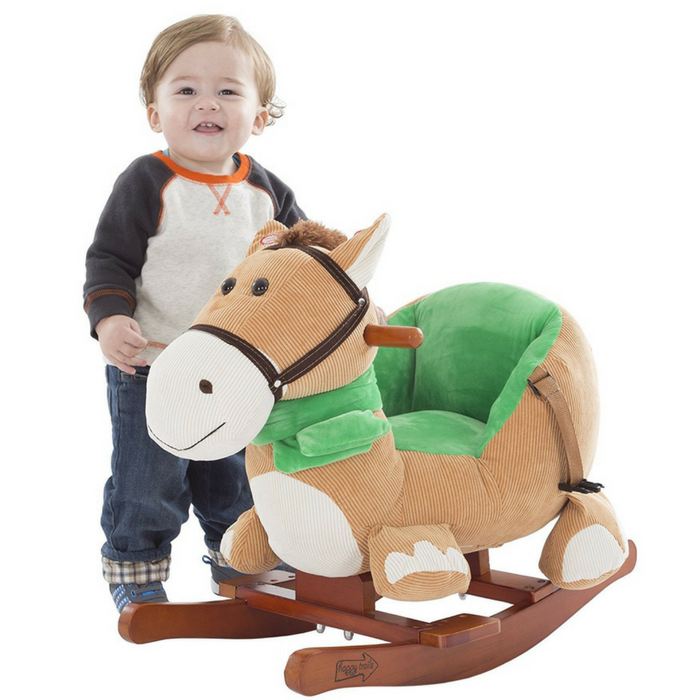 FEATURES SEAT AND SEAT BELT FOR SAFETY– The Happy Trails rocking horse, soft and plush to touch features a special three-sided seat made out of the same material as the horse with an adjustable seat belt so your little equestrian will be safe while galloping with their new friend. Install 2 AA batteries (not included) underneath the horse, hit the Press Here button on the ear, and the horse makes galloping and neigh sounds, just alike a real horse. DURABLE KEEPSAKE FOR LIFE – So life-like and well made, this furry friend will be a special keepsake for life, making it a great gift for boys and girls on special occasions. Durable to ride, yet cuddly enough to love, this rocking horse will be a treasured toy for years to come, and can easily be passed down to future generations. SATISFACTION GUARANTEED – Happy Trails is committed to providing consumers with the absolute best price and value on our entire line of products. NOTE: This is an exclusive product of Happy Trails and ONLY spring rocking animals by Happy Trails are GUARANTEED to be genuine.